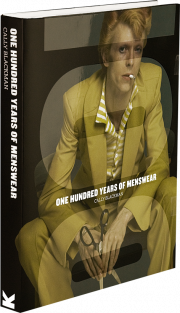 100 Years of Menswear by Cally Blackman stunningly proves my point that less text is more when it comes to design books. You can dress a woman in any kind of ridiculous confection you want, but what are the options for men? Shirting, pantalon, cravat? Not hardly, Blackman proves, largely through pictures. There’s a preface of a couple of hundred words, and each of six thematic periods (in which design and chronology are collapsed and mingled) gets a two-page intro, but that is pretty much it. The only way to read this book is the best way to read Jencks’s books about postmodern architecture – by looking at the pictures and reading the cutlines, where not a word is wasted. I gather it took forever to assemble this collection of photographs. I can see why. Any topic you will have heard of before will be illustrated by a picture you haven’t seen before. There are a few headshots of leading fashion designers and one or two movie posters (the Shaft poster is in Italian!). But the quality that creeps up on you as you devour every page – you will not skip a single one – is how deliciously unfamiliar, unanthologized, unhackneyed the photographs are. Garments originally worn for sport. Don Johnson as Crockett in Miami Vice . The pushed-up sleeve became not only a possibility through softer fabrics and tailoring, but also a sartorial emblem of 1980s fashion (1984–89).